Dave Morgan gives a sneak preview of garden secrets about to be revealed . . .
A hamlet is defined as “a small settlement generally smaller than a village, and without a church” so Withybed Green is most definitely a hamlet rather than a village – and as there are no through roads, it is hidden from the gaze of most passers-by unless you are travelling at a stately four miles an hour on the canal or walking along one of the many bridle paths in the area. But there will be nothing hidden in many of the gardens in this pretty hamlet on June 30, when their owners throw open their garden gates and welcome anyone willing to pay the modest combined entry fee of £5 as they open for the National Gardens Scheme. Keen gardeners in Withybed Green first opened for the NGS in 2010 as a group of gardens, and although they opened again in 2011 they have since decided that this should be a biennial event. This year the number of gardens open has increased from six to seven. The gardens are an eclectic mix of styles and shapes, including 6 Rear Cottages where John Adams and Amelda Brown specialise in roses with over 100 different varieties, and Fairview, a close neighbouring property, which today has herbaceous borders, a small orchard, raised beds, greenhouses and a substantial allotment where in the 19th century you would have seen the local residents rearing their pigs and chickens and growing vegetables. Then there are some narrow terraced house gardens at 2, 4 and 6 Front Cottages (the garden at number 4 is the new one for 2013) packed with a great variety of species from acers and azaleas to willow and yew, together with other features such as a vegetable patch and water features. The other two gardens are at The Mousehole, another long garden, and Selvas (meaning woodland) Cottage, which is surrounded by huge old oak and ash trees, the remnants of the old forest of Feckenham where wild cherry, wood anemones and sheets of bluebells flourish in the spinney. This garden has gradually been changed from a cottage garden of herbaceous flowerbeds to one that merges into the surrounding woodland. The seven gardens in this charming environment are close enough to allow a leisurely stroll between them and give visitors a chance to see the houses and cottages (which are not open) mostly built in the 19th century for farm workers, nail makers, canal and railway builders. There will be refreshments available and the hamlet also has its own canalside pub, The Crown. Withybed Gardens will be open from 1–6 pm. The following week, three further gardens will be open in North Bromsgrove, collectively called Marlbrook Gardens. Like Withybed Green, these three offer a variety of styles and species. In Braces Lane there is an amazing garden built into an old sand quarry at Saranacris, where owners John and Janet Morgan have created a garden full of surprises. The latest is a four-foot high Masai warrior (pictured above) made in Zimbabwe by local people using recycled metal. This garden certainly isn’t for the faint hearted, with a steep climb up either side, but on the way you can enjoy walking past waterfalls, ponds, shrubs and an abundance of hostas, and through jungle planting amidst some rare and exotic plants. At the top of the garden is a large koi pond with a new bridge over it, leading to a covered area where visitors can relax and enjoy the atmosphere. Back on the patio, this garden’s surprises are not finished as there is a large glasshouse with yet more exotic plants and a spiral metal staircase to a roof garden where you can gaze out at the whole garden and enjoy a second glasshouse. 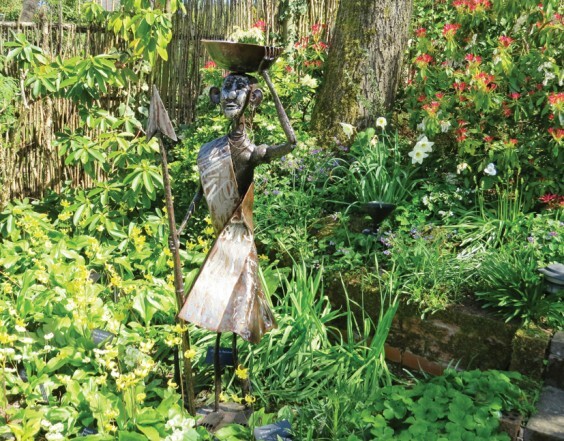 Two doors down is a more traditional garden owned by Alan and Lynn Nokes, which is packed full of inspired ideas and yet more surprises. It has been created into individual rooms and includes a secluded Mediterranean-style patio area, a large pond, lawned areas surrounded by abundant borders and a large vegetable patch with raised beds. The third garden in the trio is at Oak Tree House, just round the corner on the Birmingham Road. This is a plantsman’s cottage garden stacked full of plants and shrubs, with two ponds and a small waterfall together with other water features and a number of other artefacts and statues. There will also be a small exhibition of art created by the garden owners. Marlbrook Gardens will be open on Sunday July 7 from 1.30 to 5.30pm, combined admission £5. Refreshments and a second hand bookstall will be at St Luke’s Church hall and some of the proceeds from these sales will support the Basement Project in Bromsgrove, a charity dedicated to helping young homeless and potentially homeless people in the area. Whether you visit Withybed Green or Marlbrook Gardens (or both) you are sure to receive a warm welcome, have a great afternoon out and see some wonderful gardens whilst raising money for worthy charities. On both days children are allowed in free when accompanied by an adult.